The Queen City shines as the backdrop of this film, but see why our critic says this is the type of movie you’ll never forget. “Man, I know we decided to shoot this movie here in Cincinnati … But could someone have warned me what chili every day was gonna do to my system? 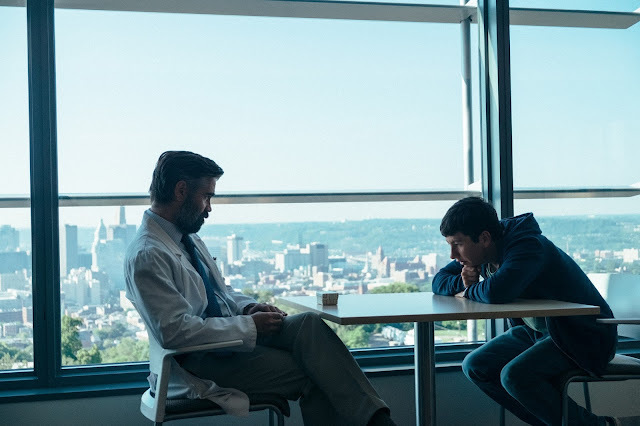 !” Steven Murphy (Colin Farrell, left) listens to Martin (Barry Keoghan) in a scene from writer/director Yorgos Lanthimos’ THE KILLING OF A SACRED DEER. Credit: Jima (Atsushi Nishijima), courtesy of A24. All rights reserved. WEB SITE: http://www.thesnowmanmovie.com/HERE’S THE STORY: Steven Murphy (Colin Farrell) is a surgeon – and a very good one. He lives in idyllic bliss with his wife Anna Murphy (Nicole Kidman) a fellow medical professional and their children Kim (Raffey Cassidy), an aspiring choir star and Bob (Sunny Suljic), who is nearing puberty. And for Steven, life as he knows it is good. Very, very good, in fact. But that’s where Martin (Barry Keoghan) comes into play. You see, Martin is a young teenager who dreams of one day following in Steven’s footsteps, which is why he’s spent the last 6 months or so mentoring the young man. Or at least that’s what Steven is lead to believe. SO IS IT GOOD, BAD OR JUST AWFUL? About 2-3 times a year, I come across a movie that is supposed to be a uniquely interesting experience. A film that is supposed to perhaps provoke, maybe even titillate or make you question something on a deeper, how does humanity-and-our-most-base-instincts-affect-us level, The Killing of a Sacred Deer is the type of movie that once you watch it, you’ll never forget it. And that’s a shame – because given that the film is the cinematic equivalent to a rough bowel movement, I truly, truly wish I could. First, the acting in the film is absolutely, for lack of a better word, terrible. Farrell and his family play the perfect suburban, white upper class family so stiffly to the point it is comically bad and highly unbelievable. In short, you haven’t seen characters this upper crust since Winthorpe’s friends sang in Trading Places and even they had more soul/realism in them than these characters. Whereas Farrell portrays his doctor as a man for whom his entire world is controlled and clinical, Kidman – who steals the easy-for-the-taking show – is prim and proper for the film’s first half to the point that her character’s attitude switch almost feels misplaced even though it is the only performance that drives the story forward. Likewise, Cassidy’s terribly over-the-top Stockholm Syndrome completely overrides whatever writer/director Yorgos Lanthimos was attempting to achieve with it, again become ludicrous to the point the film’s attempt to take itself so seriously – or maybe it’s not at all, a target if which intended also misses the mark – that her character becomes annoying. The work done by Suljic is admirable as he also maintains a modicum of reality in the situation, despite the fact the is so devoid of anything that doesn’t feel like a parody of itself that it’s hard to care. Then there’s the absolute insane use of Alicia Silverstone as Martin’s mother. The less said about it, the better. There have celebrity breakdowns more entertaining – and less maddening – than what she exhibits in Deer, and that includes her token white character in a predominantly black film role in the long forgotten Beauty Shop. Then there is the most problematic character of the film of all: Barry Keoghan’s Martin. A character that is essentially the devil incarnate with more charm, his Rainman-like presence (as a character, not as an actor) is a hard pill to swallow, especially given the lack of explanation for what he is able to do to Steven’s family. (I stay spoiler free as I know some of you will still be foolish enough to see this movie no matter what I say.) Manipulative and apparently intelligent on the level of Tobin Bell’s Jigsaw character, his demeanor coupled with his desire to rationalize his actions is at the same time perplexing, comical, ridiculous and annoying. Martin is as much a caricature of a villain as Steven is of a man placed into an impossible situation, an undeniable fact which makes the entire film feel like an overacted, overwrought and nearly cartoonish 70s B-movie masquerading as a modern psychological thriller. But trust and believe once the mask is off, The Killing of a Sacred Deer would be better as chopped venison on the bottom of a merciful editor’s floor.